Mako bluetooth speaker stand provides a great universal solution to all tablets or smart phones. A convenient way to cradle any tablet or smart phone; from 3.5" to 10.1" size, Ipad ,Samsung, HTC and many more. Using 2.1 Bluetooth technology Mako can provide reilable and secure wireless signal connection to all tablets and smartphones. With the built-in microphone you can enjoy high clarity hands-free phone calls. No need to pick up the phone just press the hand free button to provide comminucation though speaker and mic. Great for family/friends group calls and conference meeting. All music playback will pause during calls and will start again when calls finish. Enjoy the speaker any place and time, thanks to its portable design. With the built-in rechargeable battery you can enjoy upto16 hours playback*. 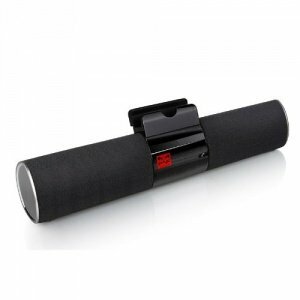 A built-in 3.5 mm jack makes it a snap to plug in any iPod or other music device that's not equipped with Bluetooth..